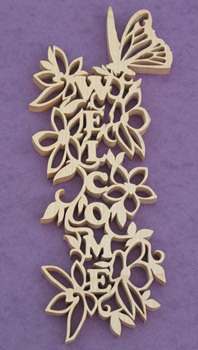 Welcome to Willow Cottage Crafts. Willow Cottage Crafts specialises in the art of scroll and fretwork to create a range of high quality items lovingly hand crafted from wood which has been meticulously selected and individually cut from native hardwood timber. As each year progresses my work continuously evolves with new ideas from items to suit any room within your home or to present as a personal gift to a loved one or special friend for all occasions. I undertake commissions for special one-off pieces, designed and crafted according to your personal requirements. All my work is individually cut on a fretsaw and finished using only hand tools, each item is treated with a fine coat of natural, solvent free plant oil to protect and enhance the natural color and grain of the wood. I am passionate about my pastime and take great pleasure in sharing with others who appreciate the natural world and the love of trees and wood which provide us such amazing colours, textures and distinctive grain patterns. Don’t forget to revisit this site to see new work added at regular intervals. Make sure you bookmark this page. Copyright © 2015 Willow Cottage Crafts. All Rights Reserved. Website by Abacus Web Studios.